Sussex batsman Luke Wells says he loves to keep busy, which is just as well. Three weeks ago, the 27-year-old became a father for the first time when his partner Marion gave birth to their son Johnny in her home town of Montpellier. This winter he’s also started an Open University degree course in European History which will keep him occupied for the next six years and is being funded by the Professional Cricketers Association. “It’s been a busy few months,” he laughed. “I’m not sure what I want to do after I finish playing so doing the OU course is a start. I did go to Loughborough University when I left school but I was only there a few weeks before I pulled out to sign for Sussex. Wells left his young family in France last week to fly out to South Africa where Sussex are on a two-week pre-season tour which includes four games, the first of which is against Western Province Academy on Wednesday (March 14). 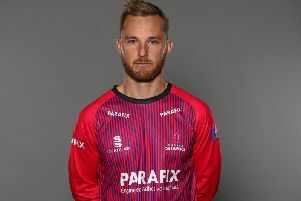 As well as getting reacquainted with his team-mates, many of whom played overseas during the winter, Wells had the chance to meet Sussex’s new Head Coach Jason Gillespie, who is due to arrive in Cape Town this week. Wells is excited at the prospect of working with Gillespie, who enjoyed phenomenal success during five years as Yorkshire coach, for what is the start of a new era at the county. While Gillespie arrives, Jon Lewis and Carl Hopkinson – two pillars of Sussex’s coaching set-up in recent years – are leaving to take up roles with the ECB while Chris Nash, Wells’ opening partner for the last few years, has joined Nottinghamshire. “It does feel very fresh and different this year,” said Wells. “We have lost some guys who have been part of our dressing room for a long time but we’re all excited about what Jason brings to the set-up. Wells can rightly be regarded as a senior player at Hove now and Sussex’s hopes of returning to the top flight in the County Championship could hinge on whether the left-hander can repeat his form of 2017 when he scored 1,292 runs – more than any other English-qualified batsman – and averaged 64.5.